Subway vs LRT? We need both, and more. Leaving items out of the transit “toolbox” unnecessarily limits network abilities and performance. Yes, of course! Everyone wants subways, as they’re the Toronto region’s highest-capacity and fastest transit mode. Unfortunately, building subways is very expensive—about three times the price of LRT—and it takes a lot longer. Above-ground rapid transit is also smart in many cases because it costs less to run. The population density in many areas of Toronto isn’t high enough to justify digging and running an expensive tunnel, just because buses aren’t enough – there are middle-range options used around the world that we can incorporate into our network too. Light rail provides a strong middle ground in capacity, speed, and cost, and should be considered as an option for projects where surface space and ridership needs warrant. If light rail isn’t sufficient, tunneled transit is appropriate. If light rail is too much, perhaps priority bus lanes are appropriate. To consider our network rationally, it’s important to realize that LRT isn’t the same as a streetcar. Instead of single cars that run in the same space as cars, light rail is made up of short trains that hold about 250 people per car and run on their own right of way (ROW). Properly designed, LRT provides most of the service of a subway at a fraction of the cost. Even a single light rail vehicle (LRV) brings higher ridership and higher reliability when placed in a private ROW. Learn more about the differences between streetcars and LRT at humantransit.org from Jarrett Walker, author of Human Transit: How Clearer Thinking about Public Transit Can Enrich Our Communities and Our Lives. The design for LRT in Toronto is not the same as streetcars. Unlike the downtown routes where streetcars run in “mixed traffic” along with cars and trucks, the light rail already being built in Toronto right now will have its own dedicated right of way in the centre or on the side of the road. In places where there isn’t room for dedicated rights of way, for example along Eglinton from Black Creek to Laird in the centre of the city, plans are to tunnel the Eglinton Crosstown line. LRT’s flexibility means tunnels, elevated sections, and surface sections are all possible, so the best design can be used in each spot. Most importantly, LRT provides service similar to a subway in many ways. 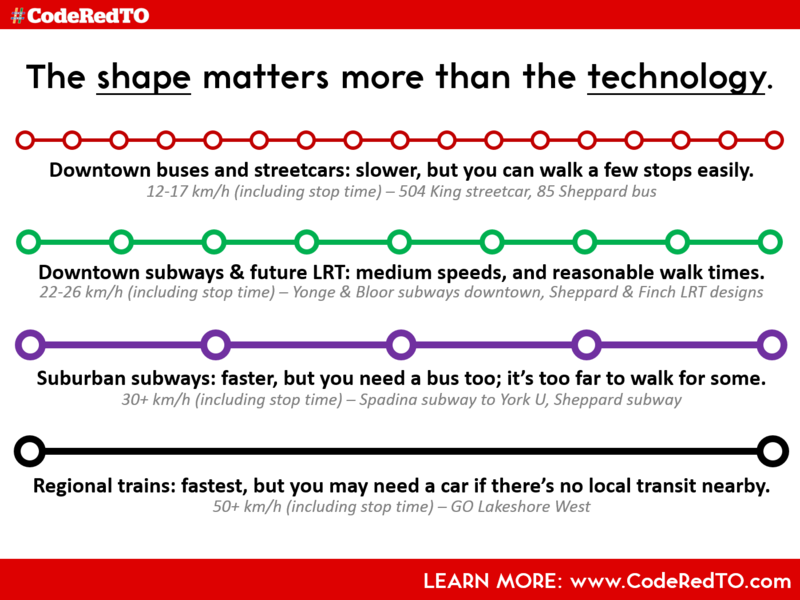 Because it’s on a dedicated right-of-way, an LRT system bypasses almost all traffic, and can average speeds 50%+ faster than buses on the same routes, with more consistent frequency. And because we can tunnel when necessary, other traffic sometimes won’t be impacted at all, and the vehicles can travel even faster too. This simply isn’t true. Toronto’s new light rail lines are designed to go in the space on either side of (or in the centre of) only the widest suburban roads (Finch West, Sheppard East, and Eglinton East all feature a city right-of-way of over 33 metres – like three downtown Yonge Streets side-by-side. No mixed traffic lanes would be removed under the council-approved Environmental Assessment plans except for one short segment along Sheppard East, and one short segment of bus-and-carpool-only lanes along Eglinton near Don Mills Road. Here is a comparison of a typical suburban street, like Finch Avenue West. For most of the roadway, car space is preserved entirely, and buses are removed, creating a more reliable transit speed and frequency. Every LRT vehicle holds up to 250 people, and since they can be linked in a train, they can carry far more than buses or streetcars quite easily. Imagine how much worse gridlock would be if each of those riders was driving another car! Here is a photo at the intersection of Eglinton and Victoria Park – called by its councillor “the gateway to Scarborough.” At this point, Eglinton is six lanes wide plus two turning lanes and a median. On either side are large grass areas, sidewalks, and parking lots. There is plenty of space to modify without impacting car traffic in this sort of street design. Modern light rail takes advantage of these areas, whereas a tunnel would provide only incrementally larger returns for a much higher cost. 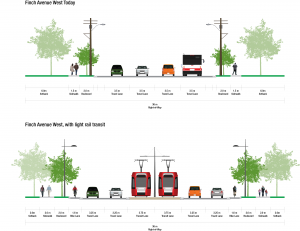 What about Bus Rapid Transit? The one inescapable fact about buses is that buses hold fewer people than vehicles on rails. To have the same level of service on a bus (that holds about 55 people) as LRT (that holds up to 250 per vehicle, or up to 750 when linked in the short trains we will eventually see on the Eglinton Crosstown) you need 5-10 buses with 5-10 drivers. Since one of the most expensive parts of the TTC’s budget is salary and benefits for workers, BRT can be significantly more expensive in this respect than rail options. 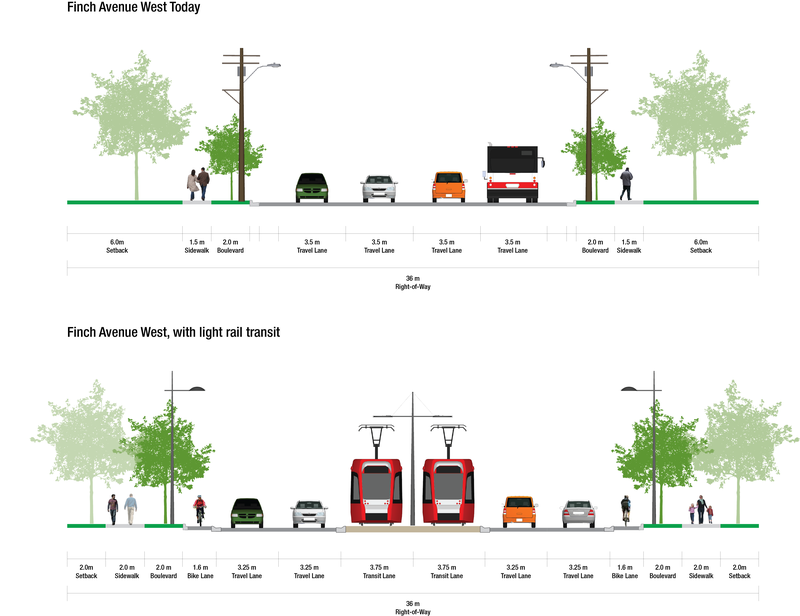 But dedicated busways do make sense in situations where road space can be reserved (often including passing lanes for express buses) and the potential exists for future upgrades to LRT. It’s important to note that busways, to be truly effective, require just as much reserved space as light rail. For a typical suburban street like Finch West, this means a complete rebuild of the streetscape to add vehicle space – just painting lines doesn’t bring enough benefit, and isn’t considered “BRT”. Subways are without a doubt a “holy grail” for Toronto transit expansion. Many politicians have been known to consider them the only transit mode worth ever talking about, to the point where no other option should be considered and residents should be left with no transit improvement at all until sufficient funding is found. This is not the way that modern transit networks develop, and it hurts Toronto to operate this way. Subways are in fact faster than light rail on average – though this is dependent upon design, and Toronto’s downtown subway is actually slower than its streetcars and buses in some sections. Speed is about design, not vehicle type or location, and more important than speed is frequency so you know you can get where you’re going on your schedule. Subways are also higher-capacity than light rail – though this too is variable, as modern light rail vehicles linked in a train can easily hold similar capacities as smaller subway trains such as Toronto’s Sheppard subway line. But for consistent headways (vehicle spacing) and travel times, immunity to all mixed traffic even at intersections, and highest capacity medium-distance travel, a subway is rationally the correct choice. Where density warrants, the cost of a subway can still be recovered through sufficient ridership and traffic congestion reduction. Toronto’s downtown has developed more than enough density to support portions of the subway – a subway “relief” line, relieving pressure at Yonge & Bloor, has been proposed since the 1980s – but Sheppard and soon the York University extension are too much, too soon: they still lose money on each rider, and will for many years to come. Given our limited budgets, investments should bring system capacity and efficiency returns sooner. Given more budget (i.e. higher taxes), adding less-efficient lines for future growth becomes more appropriate. Can surface light rail deal with our winter weather? Most assuredly! Rail performs better than rubber in nasty weather, and we see that with streetcar performance in Toronto already, especially the newest streetcars. Other cities know this too: Calgary already operates a large, successful Light Rail Transit network, and Calgary’s winters are much worse than Toronto’s. Same with Edmonton, Minneapolis, Zurich, Switzerland, and many others. In fact, hundreds of cities worldwide, including dozens in very cold northern Europe, have had great success with surface rail lines as part of their transit networks. One of the biggest benefits of rail is its ability to push through snow and ice when buses and cars lose their grip. None of them. All transit modes have positives and negatives, and are better or worse for different situations. But large, modern, successful transit networks take advantage of every mode to provide the best transit network possible. Over 80 cities around the world combine high-capacity subways, medium-capacity light rail, and low-capacity buses.